Employees of the Department "Theoretical Mechanics"
Antimonov Mihail Aleksandrovich, technician (Part-time employee). Asonov Igor Evgenevich, leading programmer (Part-time employee). Berinskii Igor Efimovich, associate professor (Part-time employee), Ph.D., Deputy Head of International Activities. Borisenko Lyudmila Aleksandrovna, Secretary of the Department. Vilchevskaya Elena Nikitichna, associate professor (Part-time employee), Ph.D.
Grigorieva Svetlana Nikolaevna, senior lecturer. Guzev Valentin Vasilievich, professor, Sc.D. Dyatlova Polina Aleksandrovna, associate professor, Ph.D., Assistant Manager. Emtsov Vladimir Georgievich, associate professor. Ivanova Elena Aleksandrovna, professor, Sc.D. Karyakin Yuriy Evgenevich, professor, Sc.D. Krivtsov Anton Miroslavovich, Head of Department, Sc.D. Krokhaleva Galina Vladimirovna, assistant lecturer (Part-time employee), technician (Part-time employee). Kostarev Aleksey Vladimirovich, associate professor, Ph.D.
Kostareva Tatyana Alekseevna, senior lecturer. Kuzkin Vitaly Andreevich, assistant lecturer (Part-time employee), Deputy Head for Research Affairs. Kuznetsova Anna Yurevna, assistant lecturer (Part-time employee). Lebedev Dmitry Fedorovich, associate professor, Ph.D.
Le-Zakharov Aleksandr Anevich, associate professor (Part-time employee), Deputy Head of Prospecting Projects. Le-Zakharov Sergey Anevich, assistant lecturer (Part-time employee). Mesheryakov Yury Ivanovich, professor (Part-time employee). Murachev Andrey Sergeevich, leading programmer (Part-time employee). 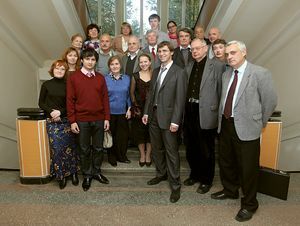 Nosov Vyacheslav Nikolaevich, associate professor, Ph.D.
Panchenko Artem Yurevich, assistant lecturer, technician (Part-time employee). Polyahov Nikolai Nikolaevich, associate professor, Ph.D.
Podolskaya Ekaterina Aleksandrovna, assistant lecturer (Part-time employee). Porubov Aleksey Viktorovich, professor (Part-time employee), Sc.D. Prokhorenko Fedor Fedorovich, senior lecturer. Sablin Aleksandr Dmitrievich, associate professor, Ph.D.
Tikhomirov Viktor Vasilevich, associate professor, Ph.D., Vice Dean. Troickaya Olga Anatolevna, associate professor, Ph.D., Scientific Secretary. Filippov Roman Aleksandrovich, assistant lecturer (Part-time employee). Shchukina Vera Ivanovna, senior lecturer. Agarkova Nataliya Nikolaevna, associate professor, Ph.D.
Zhuravleva Elena Yurevna, associate professor, Ph.D.
Ivanova Elena Gelievna, associate professor, Ph.D.
Kazakevich Andrey Genrikhovich, associate professor (Part-time employee),Ph.D.
Petrova Nina Aleksandrovna, senior laboratory assistant. Soytu Nataliya Yurevna, associate professor (Part-time employee), Ph.D.
Hitrik Valeriy Yemilevich, associate professor, Ph.D. This page was last modified on 1 June 2016, at 18:51.